I am continually amazed at all of the awesome promotional products that are unique. I had a customer today looking for teddy bears with screen printed t-shirts. And after all of my years and thousands of apparel orders, I have not ever had a customer ask about teddy bears with t-shirts. But, we do carry them! 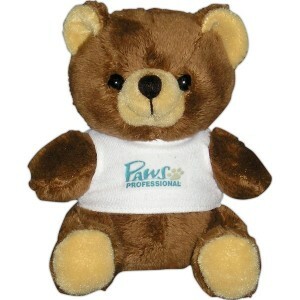 We actually have a huge selection of stuffed animals with t-shirts! Elephants, bears, cows, pigs, penguins, frogs and so much more. And the minimums for these are pretty low with just 24 of each animal. There are even bears or lions with scrubs and masks which are perfect for healthcare offices, hospitals, and more. These stuffed animals with custom shirts would make amazing giveaways or be perfect for employee milestones or fundraiser goals for your school. Chat with one of our friendly sales reps today to find the perfect option for you!